Gear up and get ready to march into battle, because this week's newest game releases are almost here! Our team of intrepid game designers has crafted challenges that will require luck, skill, and stamina... are you ready? Journey to Sky Tower Aegis: Where the Good Soar! This weekend, journey miles above Lore to an impenetrable fortress, where the the greatest defenders of Good the world has ever seen make their home - the Sky Tower Aegis! Battle to complete 17 quests from 7 new NPCs to rank up your Aegis faction reputation! Find 20 new items to collect from the Pet, Rep, and Gear shops in the Tower! Check out Laken's birthday shop in your game menu! ChessMaster Saga: Xanatos Speed Chess! The season of choices has begun! A brief moment of respite for the Chosen is, as always, rudely interrupted. Elsewhere alliances form and battle lines are drawn as the many forces pulling at them come to bear. Witness the first ever meeting between the Chessmaster and ENTROPY, and uncover evidence of the 10th orb! The luckiest helm in the land is up for grabs! You’re going to need equip all your LUCK to find it though… search through all of DragonFable’s Lore to find the key to unlock the treasure at the end of the rainbow! An all new scavenger hunt! If you can find all the keys, you’ll be able to unlock the Luckiest Helm! A brand new rainbow hammer shop! We have updates to build 0.0.66 which comes with a lot of new changes. Also, the time is coming to say goodbye to the web version of AQ3D and move testing over to Steam. If you haven't already installed Steam, now's the time so you can log in as soon as we go live! March is here, and we're ready to spring into the season with all-new game releases crafted by our team of friendly videogame developers just for you! Dage's Dark Birthday Returns with all-new gear! Log in this weekend to celebrate Dage the Evil's birthday with the Legion DoomKnight Class, new reward gear, and a return to the Laken and Dage the Evil: Queen of Envy storyline! Take on Envy and discover what the Darkness is hiding! Battle through the storyline to unlock the Seraphic Commander set! Undead Legion Members: unlock the Legion Castle and Legion Blademaster Assassin Class! After Lil'Z survives your adventures in babysitting, Zorbak dispatches Keyote the Heartcrusher The Void as a token of his appreciation and to say "thanks"! Don’t miss the awesome new keyblade coming to the Z-Token Shop, and Monkakazi leaves Battleon this week, so this is your last chance to get his BioBeasts items before they are gone forever! March Z-Token - Lazer Blazer Armor! Fashion meets function in this little number from Lazer(TM) Clothiers: The Lazer Blazer Armor is one of the bonus items that comes with the 6000 Z-Token package! Not only does it offer excellent defences and a style that can't be matched, but it also lets you fire and control lasers! The Shadows in the Darkness have failed, time and again, at returning the world… the universe… to the gloom of nightfall. Even now, tendrils of darkness, figures in shadows, and dark spirits, all plan and plot and will, ultimately, fail. Unless… unless they can learn what it takes to win. The 10th anniversary questline is beginning! A new skill for Archivist class! Never fear, and feel no dread! We've got brand-new weekly releases for you to battle through this weekend! After fleeing the Queen of Monsters' Chaos, Evil Heroes have taken over the ruins of an ancient city to make a NEW home for themselves...and they call it: Dreadrock Citadel! Unlock the exclusive Darkblood of Nulgath gear when you upgrade with any AdventureCoin or Membership package worth $10 USD or more! New phase of testing. Just... click... HERE! Over 30 new and returning items from your favorite AE games will be coming to the Golden Giftboxes. Hurry though as these items will only be available for 1 month! Also don’t miss the Bee Arthur Katana in the Limited-Time Shop - only here for 1 final week! Re-discover Swordhaven as we return to this fan-favorite town! Unlock new rewards and meet new NPCs! The BioBeasts team is working on the first major update to BioBeasts which will introduce a new beast, new mutations, challenges, ranks, and performance improvements! The update is in testing, but it will hopefully be live sometime next week! We LOVE making new releases for you each week, and this is the best time of the year to show it, because our seasonal Valentine's Day events have returned! There’s no time for love this Hero’s Heart Day, because you’ve got to free Lore from an emotional puppet-master playing with the minds (and emotions) of your friends and battle companions! Our February Rares Shop gets even SWEETER as we introduce the Knight of Hearts and Battle Q-Pid gear! 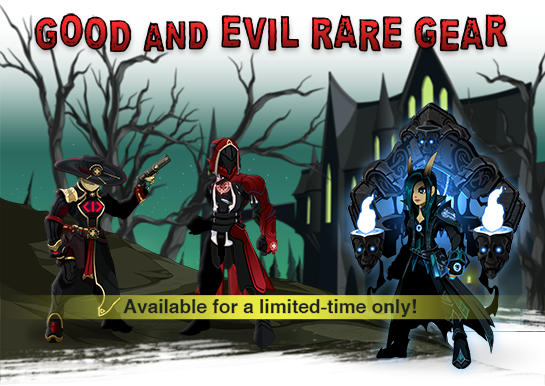 Find the exclusive February Rare Gear shop in your game menu until Monday, February 29th! Weekend of LOVE server boosts! Get 2x EXP and Reputation on ALL servers and 50% more GOLD on member servers! Player Voted Emotes Now in Testing! Check out a video of all the new emotes currently being tested, and read the full blog-post here! Stay up to date on AQ3D news by bookmarking the AQ3D homepage! If you have'nt logged in and tried AQ3D, this is the best time to do it! The new phase of testing is in progress. Just... click... HERE! It's date night - for Zorbak and Mu-Glen but... somehow it becomes your job to babysit their kid while they're out! Are you up to the task? You know when Zorbak is involved babysitting becomes anything but a standard adventure! Battle through the Hero's Heart Day release to unlock great new rewards! Deadpool fans: you'll LOVE the the Bee Arthur Katana! Only available in the Limited Time Shop for 2 weeks! NEW version of BioBeasts is live on Android and iOS! If you've already downloaded BioBeasts, check out the newest patch (1.0.24), which fixes a crash issue on older devices. 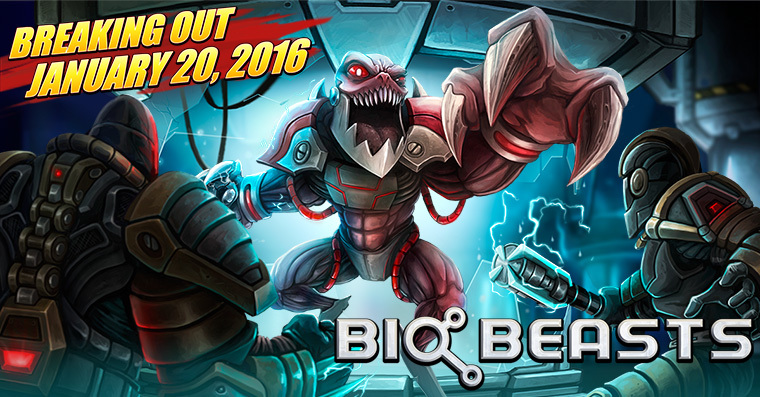 If you have NOT downloaded our newest mobile game yet, now's the time to check out BioBeasts! 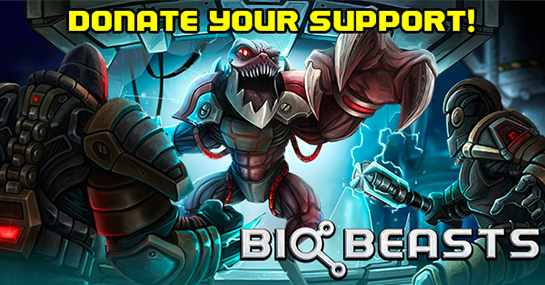 Created by the same team that made EpicDuel, BioBeasts is LIVE for iOS and Android! Help us make it a success by rating it 5 stars and telling as many of your friends as possible! Coming Soon: more challenges, beasts, leaderboards, and more! It's time to /party! We're celebrating Carnaval, Chinese New Year, AND the Superbowl in this weekend's new game releases! Battle hard to /party harder! Fight to survive the sabotage when the competition between the Carnaval and Yokai New Year festivals turns diabolical! It’s double the festival fun and twice the holiday exclusive items! Find the February Rare Gear shop in your game menu until Monday, February 29th! Get 2x Class Points Boost on Sir Ver and 15% more Class Points on all other servers! Log in this Sunday during the Superbowl Half Time Show to /punt Twilly! All of our AQ3D Guardian level backers can pick up the class from Faith in the Trainers Hall. Remember that this is the AQ3D Guardian and it is still a work in progress so anything could change but we wanted your initial thoughts. The rest of the Guardian gear and zone are still to come! Will you battle through the Underworld to create a weapon of despair? Or will you face the enemies of the Sky Realm to create a weapon of glory? Danyel and Baltael are continuing their chase after Roirr, who is now in a body of a magester. He now has an access to the Seym, where the Mana Core piece is kept. Quite the upper hand, hmm? New Roirr quest coming on Saturday! The Hero’s Heart Day Storybook! New Celebration Shops for the Lunar New Year, the Big Game, and more! NEW Mobile Game Now Available for Android and iOS! BioBeasts is now LIVE for iOS and Android! Help us make it a success by rating it 5 stars and telling as many of your friends as possible! Beasts and boss battles abound in our games this week! Read on to see what our friendly game developers have in store for you this week! Queen of Monsters Saga: Brightoak Finale! The final battle to defeat General Nevanna and save Brightoak from Gaiazor is here… The Queen’s corruption completely infected the Grove, but it may not be too late for its people… or the Mana core! It’s up to you to save the day… and the world! Unlock the Tier 2 StoneCrusher Class for 2000 ACs or find it in the Brightoak Rep shop! Nulgath's Birthday Shop leaves NEXT Friday... but Carnaval AND Yokai New Year arrive! War of the Seas + February Z-Token Package! King Mako, newly appointed ruler of the Sarkanians, has taken Aquella to be his new queen and rallied the Sarkanians to war. YOU must help Captain Rhubarb battle the forces of the seas to rescue his lo-friend! Also don’t miss Monkakazi by the fountain in Battleon selling awesome BioBeasts gear! Hurry though, Monkakazi is only visiting during the month of February, and then his items will be gone forever! Coming this week to the 7500 Z-Token Package: Celebrate your Chinese New Year with an awesome set of 3 powerful weapons! Heartbreaker/Azrael Seasonal Rares return on the Alydriod in Fortune City! Winter/Frysteland seasonal rares are leaving Monday! This is your last chance to get them before they leave for another year! Power Weekend starts next Friday! Get double XP and credits all weekend! Battle through random dungeons to find all the escaped BioBeasts! NEW Mobile Game JNow Available for Android and iOS! Help us spread the word and bring the THUNDER! Click here to donate your social reach and help us ROAR! Quest Unlocked: Submit Screenshots of AE Games! Hey guys! I am making a post for Gjappy, who is super-excited to announce an all-new screenshot contest! Gjappy the the Archangel Avatar Ambassador here - Greetings and blessings to you, adventurers! As we start off the new year, Artix Entertainment wants to venture into new adventures! Galanoth, Alina, and I assembled in the Guardian Tower meeting room after realizing that more adventurers like you know about our awesome games and prosperous worlds! But when Galanoth saw the "Emergency DragonSlayer Signal" and Alina had to rush off to put out a lab fire, it was up to me to assemble the /party and head into the Dungeon of Instagram. And for that... I need YOU! Our mission: to get the best, most action-packed screenshots from any (and all) of our games so they can be posted on Instagram! ... ANY game Artix Entertainment ever made is eligible! The deadline to enter is February 3, 2016. Send your screenshots as an attachment or link to: screenshots@battleon.com Winning entries will be posted on the Artix Entertainment Instagram for all to see! Screenshots should not be edited, just a straight, unaltered picture from the game. Winning entries will be posted on the Artix Entertainment Instagram for all to see! Do not crop your screenshot - send an image of your full game screen in the browser window. In battlescenes, try to show class skills or monster attacks going off. Winners will receive a custom avatar made from AQWorlds art, ready to upload and use on your social media accounts! There will be winners in each game category and, as always, we will reward those entries we like the best or think are super-awesomely-cool! Some of our fellow adventurers who regularly play on their evil toasters, upgraded fridges, phones or tablets might not know how to make screenshots. Don't worry, we've got you covered! Check out my guide on how to take screenshots! or watch Cysero's "how to screenshot" video! When I was still a noob (O_o) acolyte-angel in AQWorlds I made lots and lots of screenshots of my epic adventures in-game with my friends. I collected around 1.500 screenshots from just playing, meeting people, battling monsters and cool (rare) events! I could write a pretty lore of that in pictures. If YOU have a collection of screenshots, too, then post them on Instagram so we can all see! If you would like to see more guides? Let me know in the comments section below! I love making avatars (you can see some of them on the staff pages and Lorepedia)... but now I want to branch out and make them for ALL of you to enjoy! Though the screenshot contest winners will get customized avatars, there are a lot more places in the community where we can add in updated avatars, like the official forum and Artix.com! You can only choose 26 avatars on Artix.com (via this page) and there are mostly AQ classic-related. So why don’t we update it and add at least 10 more avatars from each game? Let me know on Twitter or in the comments which ones you would like to see added! PS: Lastly I wanted to say THANK YOU GUYS SO MUCH for backing the AQ3D Kickstarter and DOUBLING our goal!! Our Kickstarter backers can also now reap their rewards in AQWorlds! Read here how! AND we are making progress! And we are currently testing pre-beta for members and Kickstarter backers! Just go to www.aq3d.com to play and test! Treasure, time-travel, and a BEASTLY new mobile game? 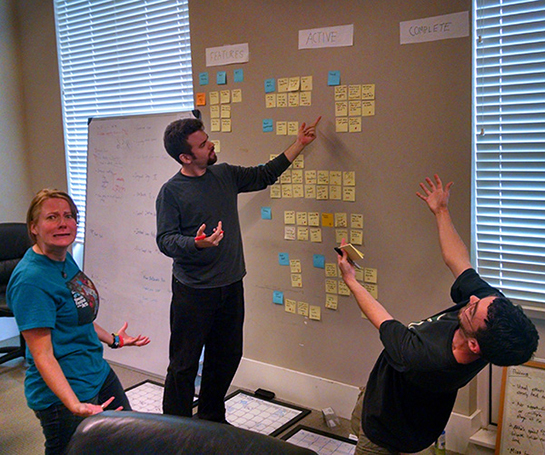 Our developers have been crazy busy this week! We've got new weekly updates in our web games AND the newest addition to our mobile game library - BioBeasts - is LIVE! Time-Travel Quest: The Hunt for Greased Lightning! Whispers of a crashed spaceship and an ancient time-traveler's hoard have reached Valencia the Treasure Hunter. Battle through the /crashsite to bring back the Enchanted Idol of Greased Lightning... IF you can survive the guardian protecting it! Battle to unlock all-new rewards after you conquer the time-traveler's ship! Don't miss the limited time Assassin Commander Limited Time Shop in your game menu! NEW Mobile Game Just Released for Android and iOS! Sailor Boon's treasure map has been in his family for 3 generations, but watch out for those who heard rumors about the treasure map-- they want it as much as you do! In honor of Dr. Martin Luther King we have hidden 2 dream-themed weapons somewhere in AQ! Find your Rare Item Hunt clues on our homepage - only available for a limited time! Also don’t miss Ziggy's Stardust spell coming to Warlic’s shop! January Golden Giftboxes - Star Sabers! These blades seem to harness the power of the stars. They are a force to be reckoned with! Collect all 6 weapons and you'll become a Force to be reckoned with! Oaklore Keep is seeing some updates this week! Log in now to check out what's new and revisit old memories! New Elite Pactagonal item drops! War has returned to the once quiet train hub of Central Station! Exiles have seized control of the COMMS Hub to feed propaganda to new arrivals at the depot. Legion forces will attempt to emit their own pirate broadcast to hijack the Hub. Who will win this battle for the hearts and minds of Delta V's citizens? You can make the difference! Woah! Woah! What is this Bye-Oh-Beasts? I’m glad you asked! If you don't want to read the whole FAQ, BioBeasts a challenging new free single-player action game for Android and iOS! You are a powerful mutant beast battling through a terrifying laboratory run by merciless mechanical guards. Defend yourself against endless hordes of robots, lab defenses, and hulking bosses as you claw, bite, blast, and bash your way to freedom! Unlock new beasts with unique powers, and upgrade potent mutations to experiment with for endless variety! BioBeasts was created mainly by the EpicDuel Team, but nearly everyone at Artix Entertainment had a hand in the project, whether it was contributing artwork, Unity expertise, testing, or simply helping us spread awareness! 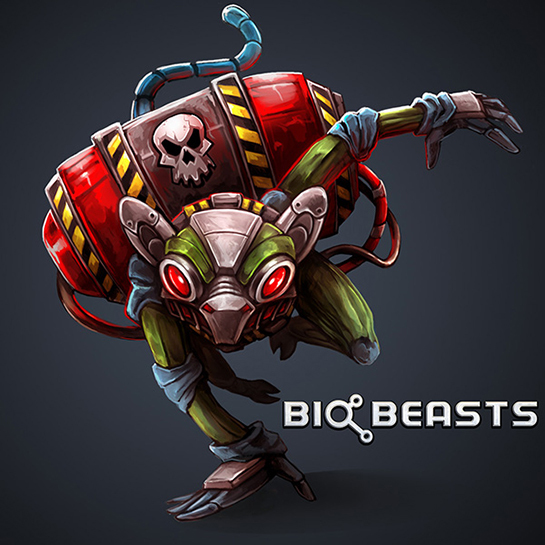 BioBeasts is nearly ready to launch, but we need your help for it to succeed! When we first started BioBeasts, we wanted a way to learn the ropes in Unity and mobile development while incorporating some familiar EpicDuel elements. We knew a huge multiplayer game was out of scope for such a project so we narrowed the focus of the project to an intense, challenging action game with surprising depth. Our goal with BioBeasts was to create a game that was a counterpoint to the current trend in mobile games that harkens back to a time when games focused on skill and reflexes. BioBeasts captures that classic feel of intense, old-school arcade games that could be understood in seconds, but took days to master. With BioBeasts, there aren’t any timers or energy systems or social gimmicks to interrupt or limit your play that have become so common in the mobile gaming generation. You can play as much as you want, whenever you want! When the game is ready, we'll smash the GO button and our message will reach tons of players! BioBeasts? Is that a new game? You're absolutely right! BioBeasts is a new arcade-survival mobile game from the Epicduel team, coming soon to iOS and Android devices! Control, unlock, and mutate your beasts as you battle to break out of the robot-controlled laboratory. You can keep up to date with all the release news and previews on their website here! Thunderclap is a crowd-speaking platform that can help BioBeasts be discovered by thousands of people. For every person that dedicates their social reach to our campaign, when we press the GO button, ThunderClap will blast out a Twitter, Facebook, or Tumblr post from all of us, at the same time, creating a massive wave of attention! Here's to an incredible 2016!